A week ago last Friday, Ella Kate and I both came down with a cold. As usual, EK had a nasty fever with hers. She ran a fever from Friday to Saturday, I think the highest it got was 103. The fever broke Saturday night and she perked up quite a bit. I just had a nasty cough and congestion and all that fun bidness. Sunday she was fine…and was able to go back to school on Monday and Tuesday. She woke up Tuesday with a slight cough, not much. I told her teachers that if the cough got worse, to give me a call and I would come get her. I usually pick her up from school before naptime, when she has a cough, so she won’t be a bother. So I picked her up and that was that. Wednesday morning she still had a cough…I started some albuterol on her thinking it was a light asthma attack. We have not had an asthma attack in 6 months, knock on wood. Wednesday afternoon, she completely fell apart. She went downhill so fast I didn’t know what to think. She didn’t sleep at all that night because of her coughing…and her temperature stayed above 103. I began administering albuterol every 3-4 hours and that seemed to help a little. So I hardly slept at all that night either. I then began planning my next move, which doctor do I call…usually with an asthma attack, there is no temperature…but usually with her asthma attacks, she does have some sort of congestion. I went in her room at 4 am to give her some more albuterol and checked her temp and it was 104.6. I almost entered freak out mowed. I loaded her up with some fever meds…made her drink a bunch, and ripped all the covers off the bed. She sleeps with 4 blankets. Michael left for work, so I put her in bed with me to keep an eye on her. Her temp. stayed steady at 104.6. I called her asthma dr. at 7:30 and they weren’t open yet…so I decided to call her pediatrician and talked to the nurse to see which dr. I needed to take her too. We decided to take her to the pediatrician and she told me what to do to get her temp down quick. She took a cold bath, drank lots of water, and ate three popsicles for breakfast. She said if the temp wasn’t down to 102 by 8:30 to bring her in…our appt. was for 11:00. I took it at 8:30 and it was 102.6, I decided that was close enough. So we went in at 11, and Dr. Scott said she was struggling for air just a little bit. He checked her lungs and said asthma was not a factor (yay!). He said he was 100% certain she has pneumonia in her lower left lung. He said it sounded like velcro being ripped apart over and over again when she breathes. I just sorta sat there…thinking alright, pneumonia…so we going to the hospital or what? He wanted us to do a breathing treatment in the office just to be sure of the asthma…and he did a white count on her. White counts were right at normal…and asthma was fine. He said he could send us for an xray, but he was 100% certain that is what it is. I said well, lets leave it at that…and leave that money in my wallet. The outcome would be the same, heavy antibiotics, and albuterol to strengthen, and open the lung. She has walking pneumonia, which is the better of the two…it can be treated with meds. So we have watched a ridiculous amount of movies over the past few days. He said the best thing for her is rest, and that is EXTREMELY hard to do when she is on albuterol. So we have been laying low and staying housebound. She had no fever this morning, but is still barking like a dog. He said she should be feeling back to normal by Sunday…which is good! We have big plans for Mother’s Day…and that night we are celebrating my parents birthdays and mother’s day! I got a big box the other day…and she has enjoyed playing in it…this was Tuesday afternoon before the big sick storm hit. 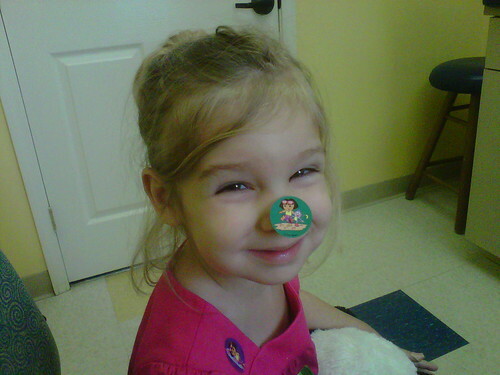 Here she is being brave at the dr. office…she just had her finger pricked…so she was covered in stickers. I wish stickers made everything better every time for everyone.